Blends -L- (bl, cl, fl, gl, pl, sl) differentiated sorting activity. 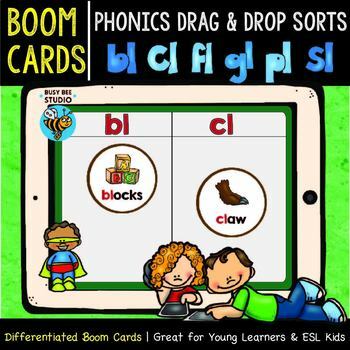 These drag and drop boom cards will help your students practice beginning blends -l- words. There are 72 drag and drop cards in this set. You are buying Boom Cards: cloud-based digital resources. Boom Cards play on modern browsers (released in the last three years). Free player apps are also available. Not sure if your browser is modern enough? Try free Boom Cards deck first. To use Boom Cards, YOU MUST OPEN AT LEAST A FREE Boom Learning Account (just like you have to have a Google account to use Google resources). Click the links inside the product .pdf to redeem your Boom Cards and create an account (or add to your account if you already have one). Free accounts include the ability to generate student progress reports for 5 students and to make up to 5 DIY decks. Free accounts include the ability to assign Boom Cards to unlimited students (without progress reports) using the Fast Play pin option available in the Library. If you are new to Boom Learning, you will receive a 90-day free premium upgrade that includes student progress reports for up to 150 students. At the end of the trial period, you will be invited to purchase the upgrade. If you do not, you will be moved to a free account. You may upgrade, downgrade or cancel at any time. If you do not upgrade, you can continue using your purchased Boom Cards with Fast Play. ★ L Blends Game "I have, who has"
Please take time to rate this product after download. I appreciate your feedback. Thank you!